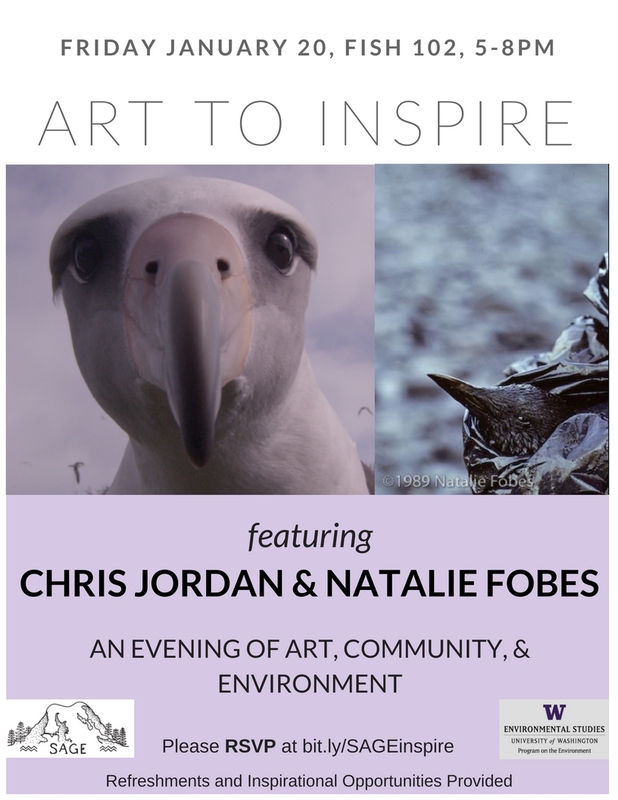 Friday, Jan 20, 2017, 5 – 8 p.m.
Join the Program on the Environment and the Student Association for Green Environments (SAGE) for an evening of conversation, community, and inspiration, featuring presentations by National Geographic Photographers Natalie Fobes and Chris Jordan. They'll be sharing how their work and their stories relate to the current environmental conversation. - Come at 5pm to mingle with peers in the environmental community, enjoy snacks by Chaco Canyon and Pagliacci pizza, while learning about UW environmental clubs and Seattle organizations. - Speakers begin at 5:30pm and will present until 7:30pm followed by a Q&A with the guests. The purpose of this event is to create an environment for community and inspiration. We hope that this event will provide a supportive space to the UW populace and inspire action! Contact uwsage16.17@gmail.com with any questions.